Form Description: Whether you are the parents, or you are the babysitter, it never hurts to have a list of emergency information on hand for the child, or children, being watched. This helpful Child Emergency Information Form is what you can use to prepare exactly that list. Use this simple list to keep track of all the vital information that is necessary for your child. Without a doubt, this simple form can be a huge help when an emergency rolls around. Who ever said that your family paperwork needs to be boring? 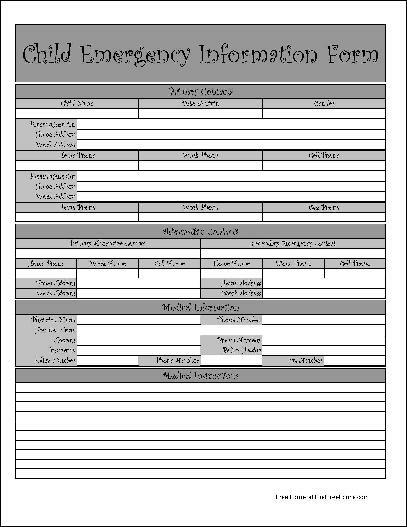 Have a little fun with your paperwork by using this fancy version of the Child Emergency Information Form. It still allows you to maintain all of the important information that you need while also allowing you to have a bit of fun at the same time. This form ("Fancy Child Emergency Information Form") is associated with the following keywords: babysitting, childcare, emergency, log, contact, information, fancy.